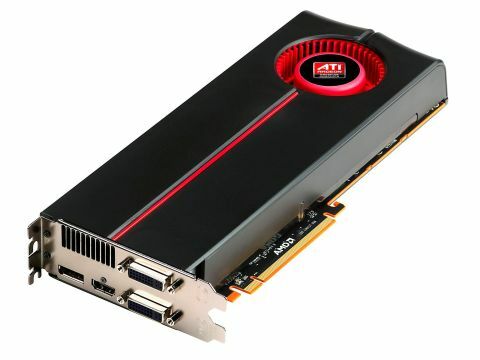 The ATI Radeon HD 5870, AMD's new premium pixel pumper, is truly a piece of work. It's not just the fastest graphics card ever, fully capable of grinding Nvidia's mighty Geforce GTX 285 into a powdery pulp. It's quite simply the most powerful computer chip we've seen of any kind, thanks to getting on for three teraflops of raw processing power. Oh, and it just so happens that it's the world's first graphics chip to provide support for Microsoft's new DirectX 11 API. It therefore debuts a number of new technologies that threaten to revolutionise the way PC games both look and play. That's right, the new Radeon HD 5870 is a biggie. Somehow, however, it's not quite what we were expecting. More to the point, not all the surprises are for the good. GPUs were growing uncomfortably large. Power consumption, board sizes, pricing – everything seemed to be ballooning. Things reached a head with the launch of AMD's Radeon HD 2900 series in the summer of 2007. It was a bloated, steaming, overheating disaster of a GPU, huge in proportions and cost but low on performance. AMD's graphics subdivision, ATI, found itself sinking fast aboard the failboat that was the graphics chip codenamed R600. Well, that's not quite how AMD put it, but you get the idea. Something had to change. Very bravely indeed, AMD decided to reboot its fundamental strategy for graphics. It would no longer take Nvidia head on in an increasingly futile contest to produce the biggest and baddest graphics card. Instead, it would build smaller and cheaper GPUs targeting a maximum retail price of around £200. For the really high end, AMD would slap two of these chips on a single card. Thus the Radeon HD 3800 series was born. It was a big improvement on the 2900 and delivered decent value, but it wasn't the full manifestation of AMD's new strategy. That came with the Radeon HD 4800 series. It was smaller, sleeker, more efficient and simply more elegant than Nvidia's colossal GeForce GTX 280 graphics chip. The net result was that the 4870 board delivered 90 per cent of the performance of the GTX for about 60 per cent the asking price. It was a winner, in other words. Central, therefore, to AMD's new strategy is delivering great performance at a price mere mortals can afford – the so called spot around £150 to £200. It's a little surprising to find, therefore, that the GPU that forms the basis of the new Radeon HD 5870 is significantly larger than the Radeon HD4870, despite the advantage of a process shrink from 55nm to 40nm transistors. Consequently, the new 5870 will sell for closer to £300.